Mr. Alayon with Training and Information Division head Dr. Edgar Amar and Chief Dan Baliao together with representatives of the recipient schools. Digital fisheries library devices, each containing over 26,000 aquatic and marine science publications, were donated to 14 state colleges and universities from around the Philippines. 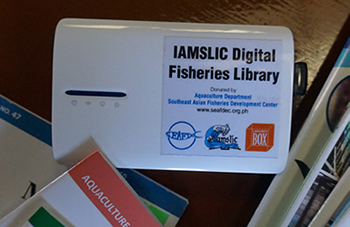 The libraries, hosted in a flash drive and Wi-Fi router powered by the Library Box software, are composed of the collection of the International Association of Aquatic and Marine Science Libraries and Information Centres (IAMSLIC) of which SEAFDEC/AQD Library is a contributing member. Stephen Alayon, acting head of SEAFDEC/AQD’s Library and Databanking Section said the device will give students access to the IAMSLIC collection even in places where there is intermittent or no internet connection. “The library of fisheries schools will just switch on the gadget and the students can download the materials to their mobile phones as long as it’s a smartphone,” Alayon added. With only half of its 128-gigabyte storage capacity used, he also said they intend to add more publications in the future as they continue to digitize SEAFDEC publications. The devices, funded by SEAFDEC/AQD, were turned over to representatives of the colleges and universities during its Book Launching Ceremony on 12 July 2018 in commemoration of its 45th Anniversary. The recipient schools included the Aklan State University, New Washington; Capiz State University, Dayao; Northern Iloilo Polytechnic State College, Concepcion; University of Antique-Tario Lim Memorial Campus, Tibiao; University of the Philippines Visayas, Miagao; Bicol University, Tabaco; Mindanao State University, Naawan; Western Philippine University, Puerto Princesa; Bohol Island State University, Candijay; Samar State University, Mercedes; University of Southern Mindanao, Kabacan; Iloilo State College of Fisheries Main Campus; Central Luzon State University; and Mariano Marcos State University, Currimao. Alayon further revealed that the Philippines is the first country in Asia to use the device with the first five units distributed in 2016 to libraries devastated by Typhoon Haiyan (Yolanda) including Visayas State University in Tolosa, Leyte; Northern Iloilo Polytechnic State College, (NIPSC) in Estancia and Cebu Technological University in Daanbantayan, Cebu. Other units were given to libraries marred by fire. These were the Cavite State University in Naic, Cavite and Mindanao State University in Marawi.